JET 1440-3PGH, 14 X 40 GAP ENGINE LATHE. HARDINGE HLV-H TOOL ROOM LATHE. WEILER 2ND OP TURRET LATHE. WEBB 3HP VERTICAL MILL, 2VS MODEL, DRO, P.F., S/N 345443. 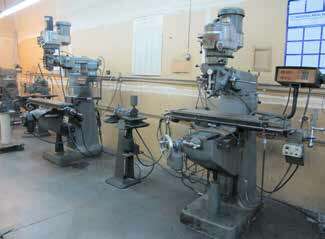 4) BRIDGEPORT VERTICAL MILLS SERIES I, VAR SPEED, DRO, P.F. BRIDGEPORT EXPLORER CNC VERTICAL MILL W/ BRIDGEPORT CONTROL. DIACRO 14-48-2, 17 TON HYDRO MECHANICAL PRESS BRAKE. MODEL 2 NOTCHER, MODEL 2 PUNCH, AND FINGER BRAKE. PEXTO 152K, 52’’ FOOT SHEAR. DAKE 50 TON H FRAME PRESS. LARGE SELECTION OF INSPECTION TOOLS, TOOLING AND SUPPORT. DELTRONIC 14’’ OPTICAL COMPARATOR WITH CONTROL. MOBILE MINI 20 FT CONTAINER.